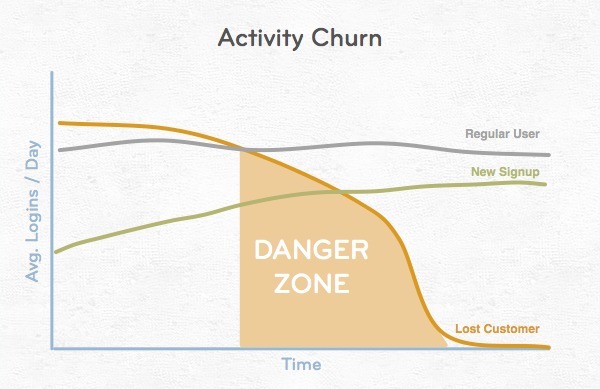 Understanding how to reduce churn is critical to the success of your SaaS company. David Skok, who is a must read for all startups, explains that as a SaaS company grows, the size of the subscribers/customers/users who no longer do business with the company will also, organically, grow. This equates to a loss of revenue, which requires more and more signups from new customers and better user onboarding just to replace what you are organically losing every month. In other words, growth slows, becomes stagnate or worse, churn is so bad, you’re losing more customers than you are gaining every month. That’s why you need to be simultaneously feeding your growth engine, while monitoring churn and your other startup metrics. 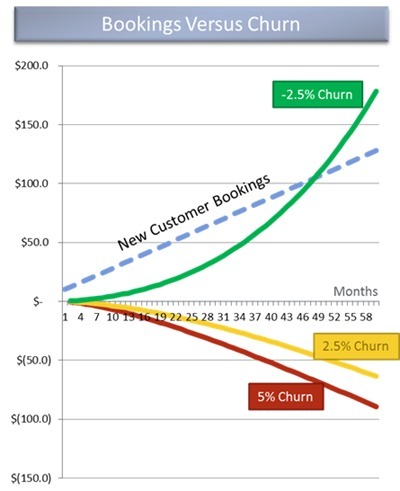 Below, are 10 case studies on how to reduce churn for your SaaS product. Before we get there though, I want to mention that David Skok points out something that can massively accelerate SaaS growth: negative churn. I have seen this happen at a few startups I’ve worked with by expanding revenue from the current product, plus up-sell and cross-sell opportunities for both SaaS and ecommerce websites, but that will be a future post on how to better sell online. Despite a steady stream of new users, SaaS startup Groove’s 4.5% churn rate meant the company’s growth was unsustainable. When they met to discuss and attempt to address the issue in January 2013, they realized they had little insight into exactly why customers were leaving. They decided to systematically research user behavior in order to determine what correlated with church. Groove uncovered distinct differences between the users who abandoned and the users who stayed. They refer to these differences as “Red Flag” Metrics (or RFMs). RFMs allowed Groove to identify which users were at risk before churning actually happened. For the first 30 days of the customer life cycle, Groove’s most significant RFMs included length of first session and frequency of logins. Total number of logins also proved to be an important metric, though not as much so as the former two. 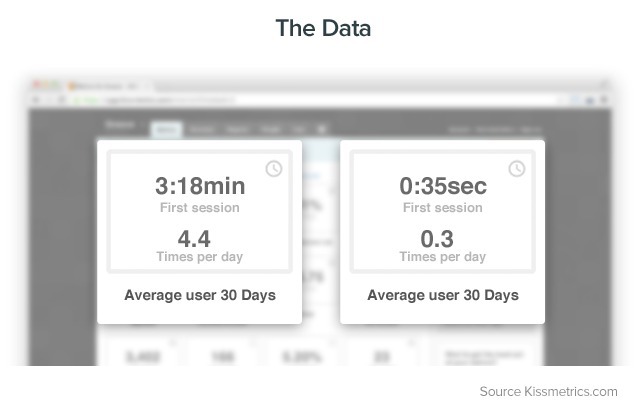 Groove found that users who stuck around after the first 30 days had initial sessions that lasted, on average, three minutes and 18 seconds. Groove uncovered another significant, though less immediately apparent, metric—time spent on a certain task. For example, creating a rule in the Groove app tends to take between 10 and 30 seconds, while customizing a support widget is a 2 to 3 minute task. Yet many users who churned had taken significantly longer to accomplish tasks such as these. Finally, Groove wanted to identify and leverage their “power users,” so they created a segment of customers who not only hadn’t quit after 30 days, but who had logged in and used the service frequently. 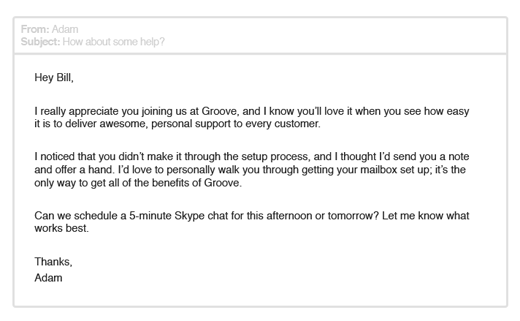 Groove’s offer to help these users through the setup process resulted in a 26% response rate. Of the users who went on to complete the process, over 40% stuck around after 30 days. This email had a response rate around 15%, and almost half of those who responded were still using the service after 30 days. 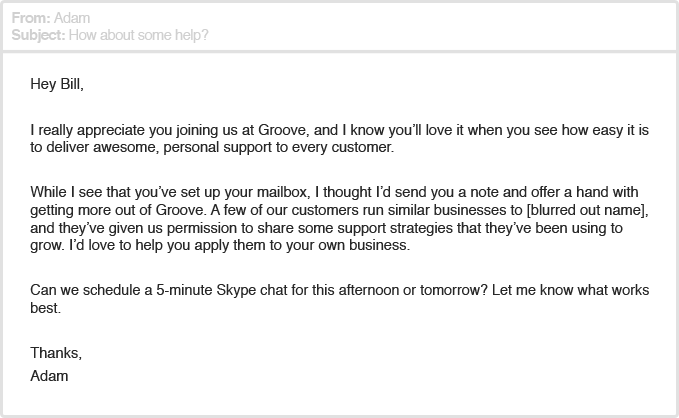 Groove was so happy with the effectiveness of these emails, they decided to integrate similar tactics into the onboarding process for every new user. 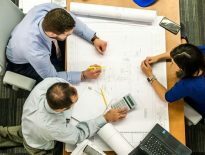 When it came to the RFM of time spent on a specific task, Groove hypothesized that the customers who took considerably longer were encountering problems of some kind. Rather than reaching out for help, those users simply quit. 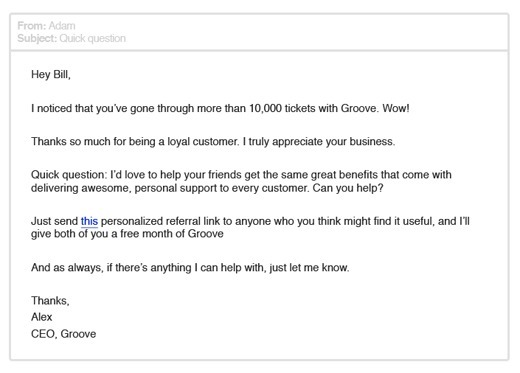 This email received a 10% response rate, and 30% of the users who responded were still customers after 30 days. 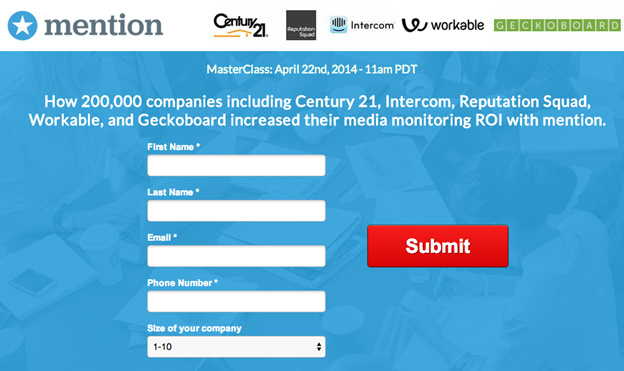 They found that their power users sent almost 400% more referrals than the control group. By identifying the behaviors that signaled when customers were in danger of churning, Groove was able to set up interventions and retain some of those high risk users. Not only that, but they also increased referrals and rewarded power users by focusing on the opposite end of the engagement spectrum. Though your Red Flag Metrics will be distinct, you can nevertheless identify the behaviors that signal when users are about to cancel or unsubscribe. Leverage what you learn to intervene with high-risk users and lower your churn rate. Unless you do some digging, you won’t know when your customers are struggling. Look for behaviors that signal when customers are having trouble and think of ways you can help them along. Don’t limit your testing to flight risk customers. Think of ways you can improve the UX and reward your loyal customers as well. Software developer Patrick McKenzie aka @Patio11 (easily one of my favorite marketers to follow and learn from) asserts that 40-60% of users who sign up for a free trial of almost every software or SaaS application will use it once and never come back. Sometimes they forget they even signed up for the application, or they realize it simply wasn’t a good fit. Often, however, they’re unable to see the benefit of using the software. Patrick claims that abandonment of this kind can be decreased by both making the software better and by better communication with users. Though it’s not possible to track when cards are actually printed, downloading the PDF file for printing is used as a proxy for tracking printing, since that’s the last observable step of the process. Though the application is designed to take seconds, Patrick hypothesizes that many users are unaware of this fact and assuming the process will be too drawn out or complicated, they quit. In an attempt to increase the number of teachers who complete the Customize step, Patrick added a visible progress indicator (pictured below). Furthermore, teachers were given the option of moving forward without making changes to the default settings, further speeding up the process. These small changes had a big impact. 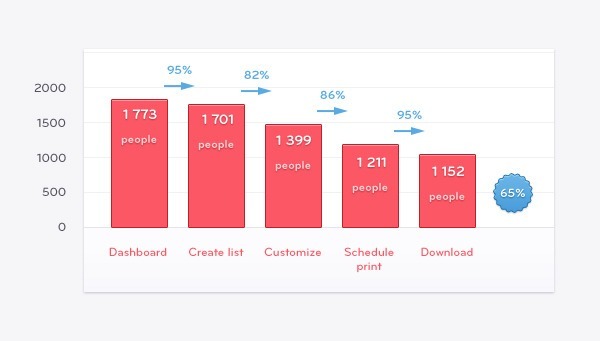 Whereas before only 82% of users completed the customize step, close to 90% made it through the test version. When using a product for the first time, users have no idea what to expect. A good onboarding process walks them through it, demonstrating the benefit and teaching them what to expect along the way. According to Patrick, the goal of Bingo Card Creator’s new user experience is getting the teacher through the funnel—and to the point at which she walks to her printer, sees the cards, and thinks, “Wow, my class will love these”— as quickly and painlessly as possible. Bingo Card Creator’s progress bar helped get more teachers to this point by making it clear just how close they were to printing their cards. For a lot of companies, the new user experience is an accident or afterthought, but expecting users to simply “get it” from the beginning is a recipe for churn. We should craft an onboarding process that moves them toward the benefit of the product as quickly and simply as possible. Product tours should not feel like work, and intelligent defaults are a great way to balance choice vs. ease—give users the freedom to customize while preserving their ability to move quickly through the process. Never stop testing and optimizing your onboarding process. Even those with “good” conversions could be better, and small improvements add up over time. In 2011, Fred Wilson cited the 30/10/10 ratio as a “law of web/mobile physics,” generally true regardless of business or industry—that is, 30% of customers will use a service each month, 10% will use it each day, and as many as 10% of daily users will be using it at any given time. Mixpanel felt that this ratio no longer held true. To establish some new benchmarks for retention, they decided to look at the percentage of people who first used a given mobile app and then used it at least once more in the 30 days after their first use. Using an aggregated set of over 15 billion actions analyzed by Mixpanel each month during August, September, and October 2013, they were able to establish new, industry specific benchmarks for retention. In the chart below, it’s clear that retention varies quite a bit from one industry to the next. Actions that went beyond instant gratification, allowing users to more fully engage with the product, proved to be more sticky. While providing value quickly is important, it’s important that that value is more than superficial. Mixpanel posits that the incredible stickiness of messaging and social apps is due to their increased level of customization. In the case of Facebook Login, for example, users can instantly access a network they’ve been customizing for months or years—the perfect marriage of instant gratification and customization. 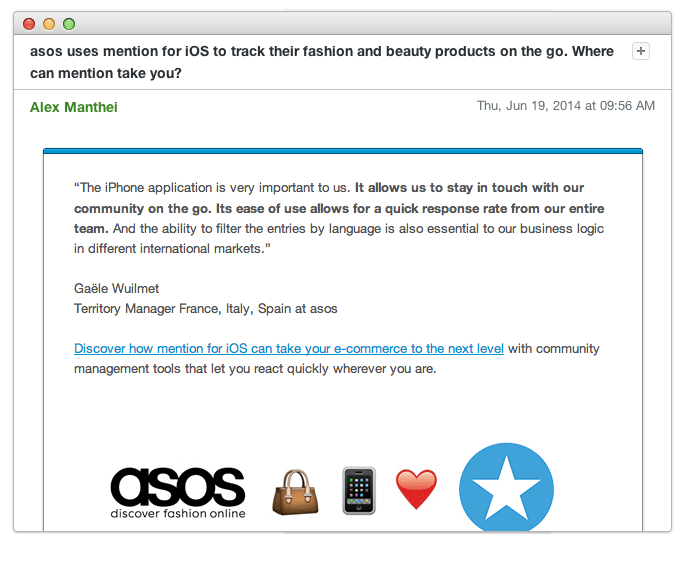 Mixpanel argues that it’s not good enough to merely meet the benchmarks in your industry. To succeed, you must beat them by consistently retaining more than the average percentage of customers. Just as numbers vary from one industry to another, what constitutes “customization” will look different for every app. 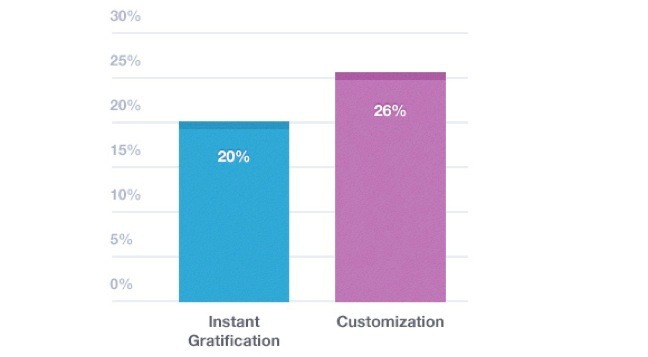 Still, it’s important to balance instant gratification with customization in a way that works for your customers in order to have an experience that keeps them logging back in. Before 2007, O2 Ireland, part of Telefonica Europe, had a ton of disparate data and very little insight as to what it all meant. Yet in the business of pre-paid SIM cards, it can be hard to know which customers to focus retention efforts on. It’s not uncommon for a customer to buy a SIM card, use it for a business trip, and then leave the country. Yet focusing retention efforts on these customers would be a poor investment. 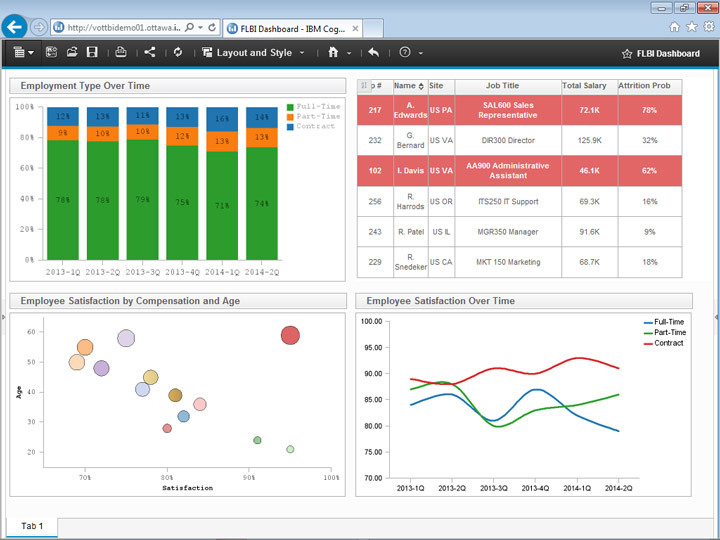 To better understand customer behavior, the company invested in Cognos Business Intelligence (BI) tools and a Teradata data warehouse. This unified system is a huge improvement over the earlier infrastructure, which was both expensive and slow. Every day, data from over 130 processes are collected in O2’s data warehouse, including the entire billing and customer relationship management system. Analysis of the company’s data revealed that only about 65% of pre-paid SIM customers have an ongoing relationship with O2 (as opposed to the traveling businessman in the scenario above). Once the company had all their data in one place, some inexplicable user behavior began to make a lot more sense. With such distinctly different segments of users, it became clear that targeting each and every one with retention efforts would be a misstep. 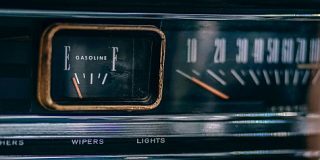 If you’re currently unable to take a holistic look at your data, the time and expense required to unify it will most likely be worth the insights you’ll gain. Understanding the various segments within your user base will prevent you from wasting your energy and marketing budget on unqualified users who are destined to churn, as well as give you insight into better opportunities for growth. Like many SaaS businesses, Mention — a service that lets businesses and individuals track what’s being said about them online — struggled with churn. As their customer base grew from hundreds to over 200,000, they realized their current efforts were unsustainable. Mention based their optimization on a few facts. For starters, they knew that paid and free trial members were more valuable than users with a free plan. They also knew that the automated marketing emails sent to free trial users were highly valuable, and that feature activation during free trial was a huge driver of conversion and retention. Having successfully used webinars as conversion tools in the past, the company also saw them as a potential candidate for reducing churn. All of this information went into the formation of Mention’s three month plan for improving communication and reducing churn by 20%. Handling support requests in batches every four hours meant more time to focus on other, equally important goals—such as weekly “support meet product” meetings in which the company used customer feedback to improve product and support tools. These changes alone meant around 50% less time spent on support, as well as higher levels of customer satisfaction for both free trial and paid users. Through a combination of the above efforts, Mention as able to lower churn by 22% in a single month—well in advance of their 3 month goal. Based on data and user feedback from previous efforts, Mention already had a good idea of what their customers responded to. Using this information, they were able to craft a strong communication plan that ultimately made their service more valuable for customers—giving them a reason to stick around. Think of ways you can extend successful campaigns—such as Mention’s automated email campaign for free trial users—to deliver value to more of your user base. Don’t expect users to automatically “get” the value of your service. Show them with tips, guides, and success stories. Intercom.io’s Des Traynor argues that not all churn is equal, and that cancellation is the final straw in a process that begins much earlier. Thus, Intercom.io’s automated emails focus on re-engaging entire teams whose interaction is lagging. Before cancellation ever happens, there are clear signals that a customer is in danger of churning. Engagement flags, and your product or service goes from an everyday occurrence to being used once a week, then once a month. Finally, they decide it’s a waste of money altogether. Rather than sending an automated email to every user who hasn’t logged in for a set number of days, Des suggests that the best time to address activity churn is when you see a drop in usage across an entire team—an indication that your service is losing its value. Many SaaS products are built around teams. Think project management (eg. 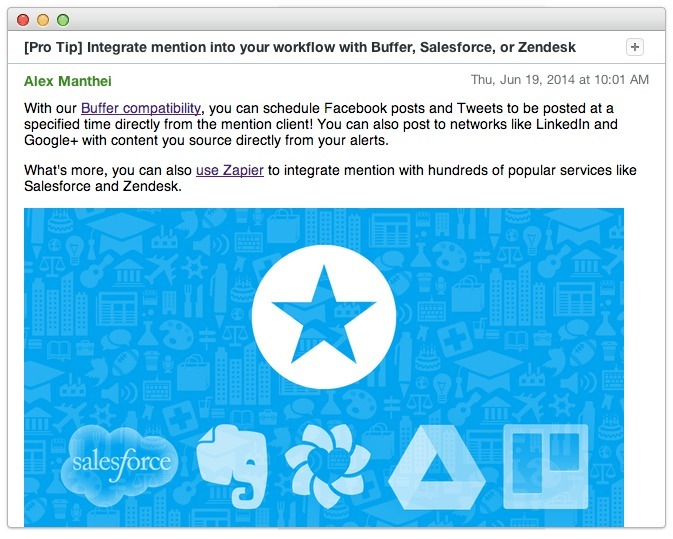 Basecamp and Mavenlink) or accounting software (eg. Quickbooks and Xero). As the image above depicts, an individual customer might be on holiday or working on different projects, therefore their usage will temporarily stall. But when an entire team, whether it’s a group of three or 300, begins to noticeably drop, action must be taken. When companies measure churn based on cancellation alone, they miss the opportunity to reengage the once-a-week user who, unlike the cancelled user, can still be retained. Even when users insist on leaving, it’s possible to gain insight into their objections and craft a better service that ultimately lowers churn in the long run. 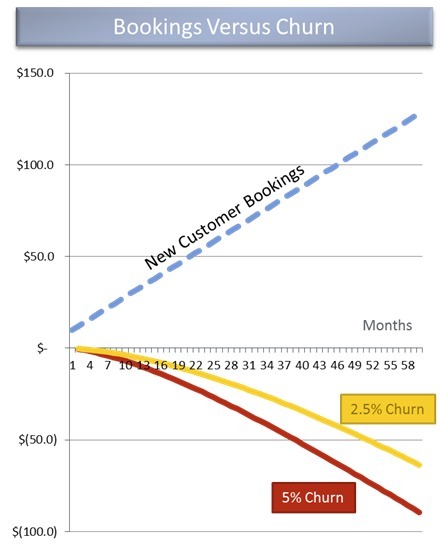 The key is understanding that churn happens long before customers decide to cancel. Understand the difference between someone who didn’t convert after a free trial and someone who has been active for a year before slowly disengaging. They have different relationships with your business, and sending the same email to these two customers would be a huge misstep. Automatic “Dear Customer, We miss you!” emails will seem disingenuine to long-time users who are experiencing serious issues with your service. For long time customers, define the metrics that indicate a drop in engagement. Check your analytics to find the common patterns of churned customers & schedule the intervention when they can be considered “disengaged”. If your product revolves around team usage, find ways to bucket their usage together and measure that over time. Teams are less likely to churn if they are happy with your product because of the costs to move to another software solution. Give customers a reason to log back in by offering a sneak peek of a new service or a reminder of features they’ve found valuable in the past. Accept that you will not be able to retain or re-engage every customer, and it will only hurt your reputation to fight back or spam them for months after cancellation. CHI is a play on the Chinese word 气, which means life force, and is a great indication of not only how much a customer will benefit from HubSpot but also how happy they’ll be with the service and how likely they are to renew. 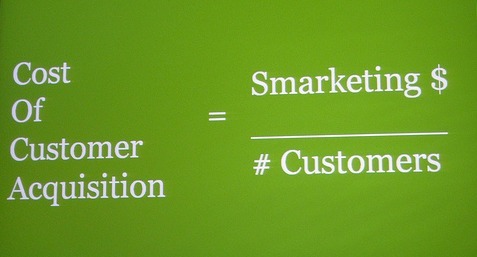 HubSpot calculates customer acquisition costs (CAC) by dividing the amount spent on Smarketing (according to HubSpot’s Dharmesh Shah, the total cost of sales and marketing) by the total number of customers, as shown in the equation below. For a company to succeed, customer acquisition cost must be less than customer lifetime value (the amount he or she pays throughout their time as a customer), otherwise customers are costing rather than contributing to revenue. Lowering acquisition costs is one way to lessen the burden, but lowering churn is also critical, as the longer customers stick around the more they end up paying in subscription fees. Because churn is a complicated metric, HubSpot wanted to implement a more concrete measure of customer success. It’s not good enough for customers to merely stay subscribed, especially when plans that lock customers in for six months or a year can make it hard to measure satisfaction based on churn alone, and by the time a customer cancels or unsubscribes, it is often too late. Yet customer satisfaction is critical to keeping churn low. Rather than looking at churn alone, HubSpot uses their Customer Happiness Index as a more holistic representation of success. CHI is calculated based on several factors, including how frequently customers blog and track leads through HubSpot’s system, whether they run email and conversion campaigns, whether they engage in social media, and more. 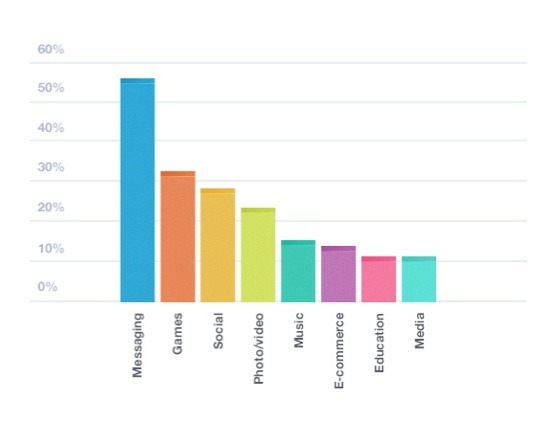 These inputs are weighted according to HubSpot’s analysis of thousands of customers over years. Any time a new customer signs up for HubSpot, they’re assigned an Inbound Marketing Consultant who will help implement the software and work with them for the first few months of using HubSpot. 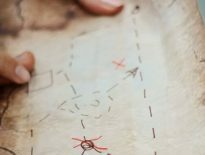 Though many customers are familiar with inbound marketing, others are starting from scratch, and HubSpot offers a mini-education in inbound marketing to help customers achieve the highest CHI score possible. Regardless of age or experience, each customer receives a personalized monthly account review, the goal of which is to help them get as much out of their subscription as possible. HubSpot uses CHI as a gauge of how much value the service is delivering—a critical component to lowering churn. CHI not only serves as an indicator of which individual customers might need additional help, but it’s also a broader guide as to which of HubSpot’s strategies are working well and which ones are not, giving the company insight into broader, company-wide changes that can be made to increase happiness and reduce churn. To identify the factors that contribute to customer happiness, measure as many dimensions of usage and engagement as possible. Identify the segments with the highest success based on satisfaction, engagement, retention, or another metric that matters to you. Run regressions to identify which factors contributed to the success of your power users, and combine them to create a scale or score that predicts whether or not other customers will be successful. Make changes to your acquisition, onboarding, support, and more to drive that score up for each and every customer. According to Zack Urlocker of Scale Venture Partners, the inefficient old school field sales model had one major advantage over the current, high-volume SaaS sales model—human touch. Employees were up close and personal with customers, giving them the ability to ensure that the product was delivering value. Today, online sales are fairly anonymous, especially in larger organizations with a high volume of customers. It’s no longer easy to identify how they’re using a service, whether it’s making their lives easier, and how they might be struggling—which means it’s harder to prevent them from churning. Zack wanted to help Zendesk avoid being the kind of company who only calls when seeking renewal, so he helped the company to implement a Customer Account Management (CAM) team that reached out to Zendesk customers using a 12 month program with regularly scheduled check-ins, phone calls, and emails. 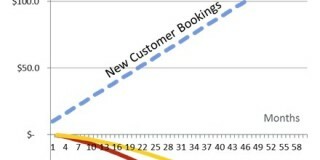 This proactive approach helped to identify and curb potential issues before they could contribute to a negative experience with Zendesk, and the close relationship between Account Managers and customers meant that issues like new management or lack of engagement (both of which put an account at risk for churn) could be identified and managed early on. CAMs also provided information about new features, best practices, and resources to help customers get the most out of Zendesk, and they connected customers with Support and Engineering to help resolve problems quickly and efficiently. This ongoing relationship helped Zendesk to earn trust with customers, resulting in more upgrades and referrals, as well as below-industry churn rates. Adopting a new software solution can be difficult. Until customers are reaping the benefits, they see it as more of an obstacle to overcome than a valuable part of their business. By assigning customers a CAM, Zendesk helped to make the transition easier, forming a positive relationship in the process. I have done this at both BigCommerce and Mavenlink, and highly recommend it. The amount of contact you’ll have with your customers depends on the service you provide. 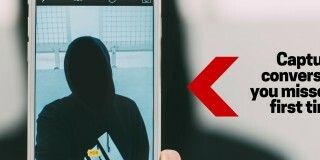 Though a high-touch CAM team might not be right for you, the only time customers hear from you should not when you ask them for money. Use analytics to identify the points at which customers are most vulnerable to churn, and craft a plan for reaching out in a genuine, human (even if automated) way. Provide resources, best practices, or a voice or video chat where they can find support and guidance. Once you have an idea of which actions generate value for customers, trigger-based emails are a great low-effort, high impact way of encouraging those actions and thereby reducing churn. 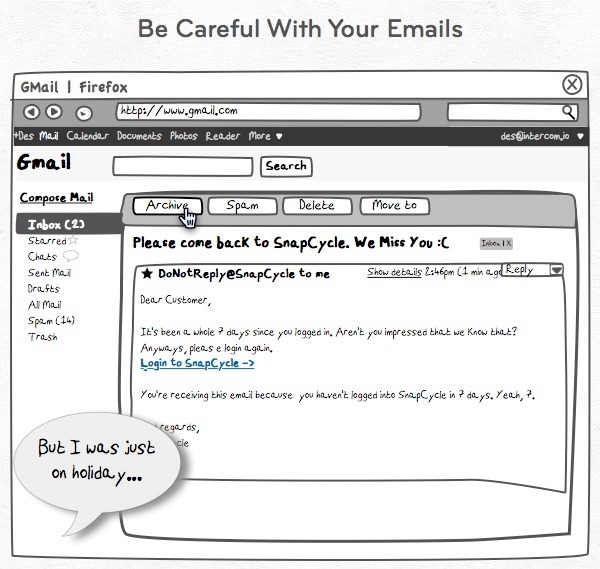 These emails are based on specific user actions. For example, if someone signs up for your service but never completes the setup process, a trigger-based email from the help desk might offer one-on-one guidance through setup. In a study by Experian, they saw follow-up trigger-based emails result in an average 54% increase compared to just sending one message, and emails based on products a customer has viewed achieved a 3.4x lift in revenue compared to promotional mailings. In addition, companies like and Smart Furniture were able to increase email open rates by 311% by increasing their list segments from six to 30 for more highly targeted emails. For Buffer, lots of scheduled tweets indicates that customers are getting value from the service, while letting a Buffer account lie dormant is the first step down the road to cancellation. In fact, they saw 33% of churned users were actually still active the day they canceled. 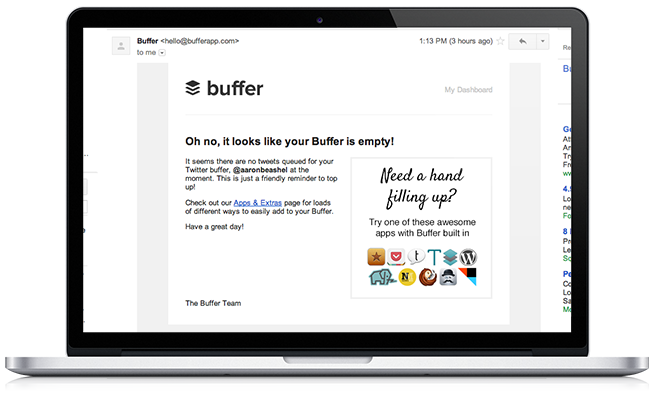 This is contrary to expected user behavior, so Buffer started emailing customers when they had no future posts. To increase retention and provide additional value, they not only made their customers aware that their Buffer queue was empty, but provided other popular applications they integrated with to make the sharing process more seamless. Use analytics to identify your power users. Which actions have they completed that less valuable customers or customers who unsubscribe haven’t? Take this information and come up with what an “Activated” customer looks like for your business. Use a tool like Customer.io, Vero, or Hubspot Enterprise to set up trigger-based email campaigns encouraging less active users to take steps toward activation. 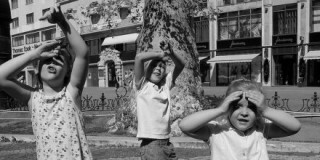 Try a tool like Fomo to provide real-time customer interactions, so others can see what people are doing or buying on your site around the world. Put simply again, churn is extremely critical to the success of your SaaS company. There are many ways to reduce churn (or possibly create negative churn) with an underlying theme of communicating with your customers. Some of these case studies directly or a blend of several should be able to reduce your churn immediately if done properly. If you implement any variation of the examples above, I’d love to hear your results. Lastly, Andrew Chen and Christoph Janz put together a great spreadsheet for churn, MRR, and cohort analysis. Thoughts on the above case studies? What experiments have you run, successfully or unsuccessfully, to reduce churn for your product? Casey Armstrong is a full stack marketer who focuses on customer acquisition and revenue growth for startups. Along with his own projects, he's worked with startups, such as Pivotal Tracker, Mavenlink, and Pantheon. You can connect with Casey on Twitter here. If any of you have any questions on my post above, startup marketing, or other parts of the marketing stack, please let me know here in the comments! Also, glad to get my first post up on ConversionXL after following what Peep, Tommy, and team have been doing for quite awhile. Always impressed with the quality and care they put into their work. Great to see it firsthand. Just wanted to say I enjoyed it. It was truly well done. Lack of churn and repeat business have been the biggest reasons for the success of @TribeBoost. More #SaaS companies should focus on that instead of getting new leads. @Kevin – Thanks! What have you guys done at TribeBoost to reduce churn? Or create “negative churn” on upsells, etc.? It is really simple, we just deliver for our clients and work hard at what we do. Delivering for them means that our churn rates are very low, our trial period conversions are very high, and we get a lot of repeat business. Great post! There are a lot of ways to reduce churn but I think it starts with knowing how engaged your users are using behavioral analytics and then being able to take action on that information both within the application through messaging and personalization of the app and outside of the app, more of the personal touch. In my role at Evergage I work with a lot of customers who are trying to reduce churn and our tool has been key for them to get insight into users behavior in the app and take action on it to increase engagement. I am definitely going to use some of these points to offer our customers help in areas outside of what Evergage does. Thanks! Agree with your points. In SAAS industry, one does not simple focus on sales. They should do their homework on entire customer life cycle. Repetitive business is must since it is a month game. Consumer may switch at any time in a month, unless he/she has paid for annual subscription. The split at app configuration tells me that your site is for geeks, not consumers. It really doesn’t matter who you say you are marketing to after that. These are mutually exclusive communities. Movement towards consumers is likewise a movement away from geeks. @Alok – Thanks. Do you have some examples on how you’ve attacked churn?